The way, new developments are going on or new technologies/applications are launching by companies in the IT industry, it is generating jobs in Software testing industry to test applications & fixing the bugs. They are requiring hot skills like backend testing, Issue/defect management, Automation testing. Infotek Solutions offers a career-changing program in SoftwareTestingalong with Software testing(QA) certification. 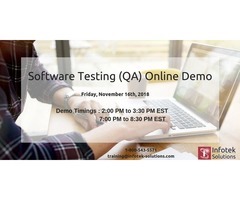 This program includes a comprehensive list of software testing hot skills, working on liveprojectsand JobPlacementopportunities. Concepts of Manual testing like Test cases, Test plan, traceability etc. Apart from training, there will be separate InternshipOpportunity of getting experience with live projects during and after ITtraining as well as year-long JobSupportandguidance. If you have already completed training and want to brush up the Software testing skills then our Mentorship portal will help you to brush up your skills. 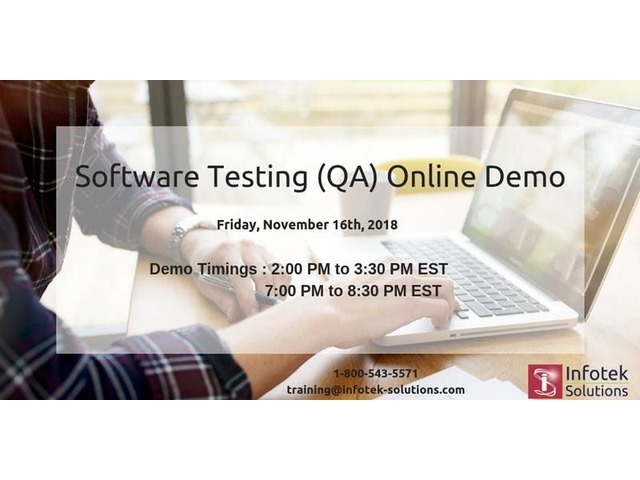 You will get various interview questions for various topics of Software testing(QA) and placement related stuff like Resume preparation, job support guidance, etc. If you are from the NON-IT background and want to switch career in IT then this training will help you to switch career from NON-IT to IT and help you to enter in IT industry with confidence. How to receive joining link for a demo class?